To stay competitive in today’s global economy, you need more than simple financial accountability and compliance. A powerful financial management solution is the foundation to help you improve productivity, envision success, and accelerate growth. Financial-based businesses all depend on real-time visibility, collaboration, agility, and most of all compliance in order to achieve success. The General Ledger module is the heart of your financial accounting processes. Sage 300 ERP provides the flexibility to meet the current and future financial management requirements of organisations of all types and sizes. It provides a robust feature set designed to handle your most demanding budgeting and processing needs. Built into the Sage 300 ERP General Ledger module, the Financial Reporter Tool allows you to easily create accurate financial reports, such as an Income Statement Summary, Balance Sheet, or other Excel based reports. The Financial Reporter is a powerful reporting tool that uses Microsoft Excel to manipulate, format, graph, and print general ledger data. General Ledger seamlessly connects with all modules and is the key to maximising the efficiency and accuracy of your financial data. The G/L Consolidations module lets you transfer and merge General Ledger account and transaction information between separate company and branch office locations. It is also designed to enable subsidiaries and holding companies to run across different networks and accounting databases. G/L Consolidations allows your company to define the level of detail to consolidate and provides a comprehensive audit trail. The system is available in two versions: a full version for the head office and a remote-sites version for branch offices. Easily manage your cash flow, track and predict purchases, and analyse expenditures and product purchases while maintaining good vendor relationships. Sage 300 ERP Accounts Payable provides quick access to the type of comprehensive data that allows you to analyse the past, monitor the present, and plan for the future—helping you make the right decisions today to gain a competitive edge. Effectively manage your cash flow, track and predict customer buying patterns, analyse sales, and provide a superior level of customer service. Sage 300 ERP allows you to gain complete control of your receivables and invoicing processes and leverage automatic calculations that avoid errors and eliminate duplicate data entry. Consolidate customer receivables, statements, reporting, and credit checking across national accounts. Accounts Receivable offers prompt access to the type of comprehensive data you need to analyse the past, monitor the present, and plan for the future—giving you valuable insights to make the right decisions. The Intercompany Transactions module simplifies and significantly reduces the amount of work required to record General Ledger and Accounts Payable transactions across multiple companies. Using this module, you can automatically distribute your transactions to the appropriate companies and corresponding intercompany loan accounts based on relationships you define. When operating in different countries, you need the ability to support the local language and accounting standards such as reconciliation and taxation. Sage 300 ERP includes five language overlays that allow you to configure the language of the software for individual users. You receive English, Spanish, French, and Simplified and Traditional Chinese out of the box. In addition, due to the configuration flexibility, the software allows you to provide local language, tax, and accounting rules through seamless default settings and templates. Businesses that want to succeed in the world market need core financial capabilities with the flexibility and power to handle the complexities of multicurrency enterprise. The system’s Multicurrency module provides robust multicurrency and analysis capabilities so you can optimise your international opportunities. To make effective decisions in today’s fast-moving business climate, you need accurate, up-to-date information on your company’s cash position, as well as reliable projections of future cash balances. The System Manager module in Sage 300 ERP comes equipped with comprehensive bank reconciliation functionality, which enables you to quickly and accurately reconcile all of your bank accounts, as well as perform bank transactions with pinpoint accuracy. Bank reconciliation is built into the System Manager, providing seamless connectivity to all submodules to help you better track your cash position, so you can make insightful and timely decisions for your business. Sage 300 Fixed Assets—Depreciation accounts for your company’s tangible assets (laptops, copiers, production machines, and other business equipment), automatically calculating depreciation and tax deductions and eliminating the need for off-line spreadsheets. Sage Fixed Assets Inventory takes depreciation one step further with a sophisticated bar-code system that empowers you to easily track the physical location of assets using a convenient handheld radio-frequency device. 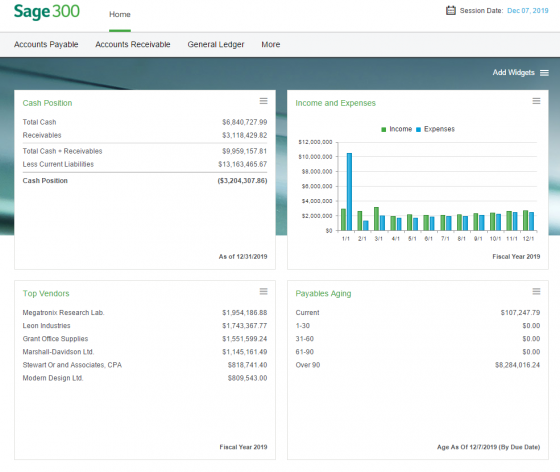 The business intelligence tools of Sage 300 ERP help you increase insight into your business and make faster, more effective decisions. With real-time metrics and the ability to create personalised dashboards and meaningful reports, you have up-to-the-minute visibility across all departments and companies in your system and at-a-glance analytics that can be used for strategic planning. Business intelligence tools can help you optimise business processes companywide and provide decisionmakers with insight into financial and operational performance. Using a single solution that ties together and streamlines all of your processes, Sage 300 ERP helps you improve collaboration and accelerates information exchange for a 360-degree view of your business.